The original ANDERIC Slim Style RR7216T for Hampton Bay FAN-HD UC7078T Remote Control is in-stock and ships within 24 hours. The original ANDERIC Slim Style RR7216T for Hampton Bay FAN-HD UC7078T Remote Control carries a 1-Year Warranty. 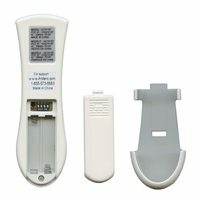 The Anderic RR7216T remote control replaces the original equipment Hampton Bay and Harbor Breeze ceiling fan remotes. It is a great slimmed style of the popular FAN-HD (UC7078T, RR7079T, UC7083T, FAN53T, FAN35T, FAN11T, FAN-HD, HD5) remote. 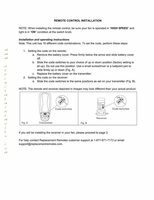 The RR7216T will work right out of the package for compatible Hampton Bay and Harbor Breeze ceiling fan models listed (but not limited to) without any programming (other than aligning the dip-switches to the correct pattern to match your ceiling fan receiver). This remote includes all the fan speed and light buttons. The RR7216T remote also works light dimming. This remote comes with a 1-Year Replacement Warranty. Warning: make sure you are using Incandescent bulbs or your fan will not dim properly. by Keith on January 17, 2019.